that cockroach is disturbing. and I also find it disturbing that you don't find it disturbing. how long did it take to put the "finishing touch" on that one? Whee! Can I get the code? I promise to share with you some of the cool stuff we're doing! The framework, so far about 8 hours of work. 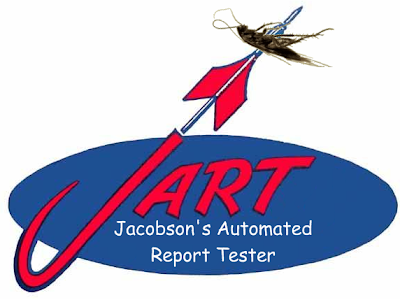 The JART logo, about 30 hours. In all seriousness, the cockroach, as seen in my TestThisBlog header, was found dead on my dining room floor. I snapped the photo of it flipped over, just like it appears now. When I first moved to Georgia I found these bugs disgusting. But now that I've tested your code, I realize there are far larger bugs to worry about. Sure, I'll send it to you. But only if you promise to post about how great of a coder I am and how you want to buy a JART t-shirt. ...or maybe you can write my some QTP code to interact with those damn Synfusion grids my devs keep using.